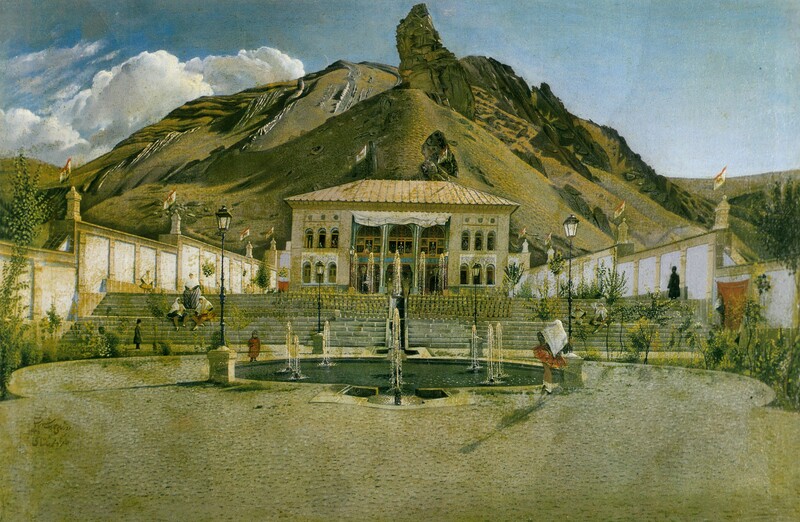 23/08/1866 – Was Tinco spying at Shahrestanak? We couldn’t help it. The two-day excursion that Tinco Lycklama made to Shahrestanak just begs for a provocative title. In all fairness, we currently have nothing solid to suggest that Tinco Lycklama was doing anything else but traveling Persia as a tourist. However, the trip raises a few questions – just like many other things in Tinco’s writings. 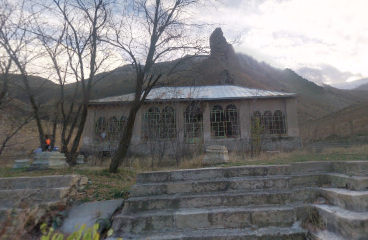 For now, we’ll essentially stick to the description of the trip to Shahrestanak – a valley and village north of Tehran, deep in the Alborz mountains. In the summer, when 19th century Tehran suffocates under a sweltering heat, most inhabitants seek the coolness of the countryside and – those who can afford it – move higher up in the foothills of the Alborz. Tinco had done so himself in June 1866, when he rented a house at the lush village of Tajrish, just north of Tehran. Naser al-Din Shah moved even further, to the Shahrestanak valley. The Qajar court painter Kamal al-Molk produced a fine painting, showing how the Shahrestanak Naseri palace look like in the 19th century. However, that palace was built only around 1878. At Tinco’s time, in 1866, there was no palace but a summer encampment built of tents. It must have been a huge settlement, as the whole court in Tehran followed the shah (and his harem) to the valley. Also, his top military command and two full regiments set up base near the royal tents. In addition to that, large numbers of servants and tradesmen moved into the valley, to serve the needs of the court. Though Tinco doesn’t give us any numbers, we’re easily talking about many thousands of people! We have no photos of the Shahrestanak encampment. 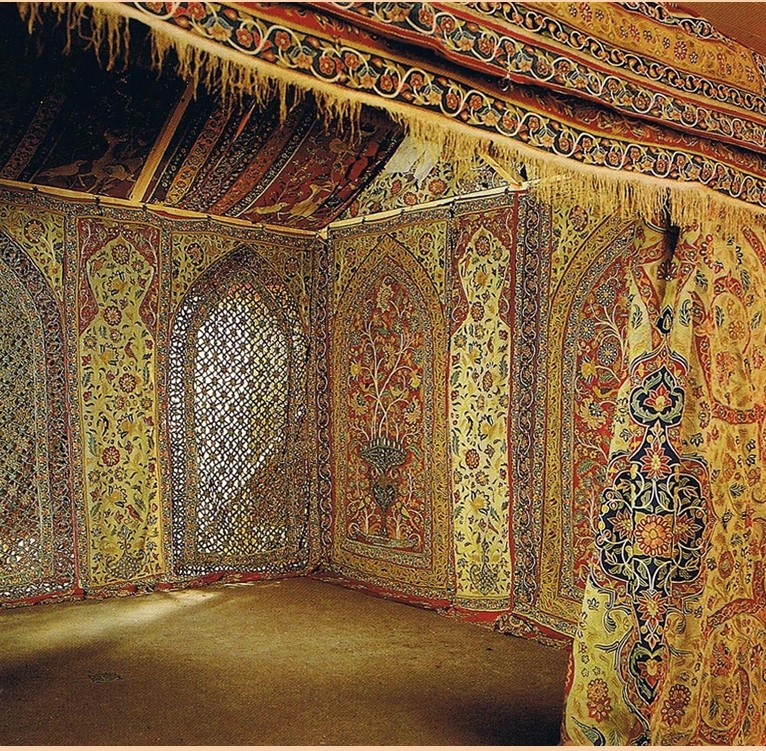 However, a few pictures of a typical royal encampent and a royal tent of Naser al-Din’s father Mohammad Shah Qajar (1808-1848) can give some idea of how it looked. To house that many people at Shahrestanak, just imagine the encampment on the photo many times larger. In the summer of 1866, Naser al-Din Shah and his court must have arrived by the middle of August (for over a month – as Tinco meets the shah in Tehran later in September). So, with all the notables gone from Tehran and the surrounding palaces, Tinco decided to follow and travel to Shahrestanak. He set off in the morning of August 23, and took the shortest but most perilous route to get there. He traveled on horseback, accompanied by two of his servants as well as a mule to carry his equipment. He didn’t take a tent along as one of the servants, Ismaïl, knew how to organize lodgings in the village of the Shahrestanak valley. The trip took over 6 hours – across two major mountain passes and along precipitous ravines – before reaching the valley. 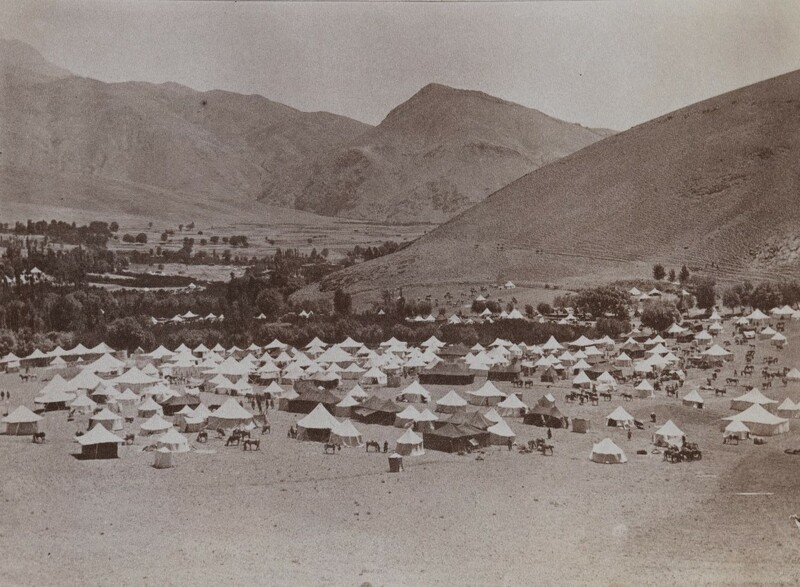 The tent encampment was located at the same spot where the Qajars built the palace in 1878, and it straddled across the banks of the valley river. From higher up, Tinco had an impressive view on the layout of the camp, where the royal tents and those of the harem were clearly distinguishable by their red color. Approximate map of Tinco Lycklama’s excursion to Shahrestanak 23-24 August 1866 – directly north across the mountains, and then back following a longer but easier road. At the time of this excursion, Tinco had not yet met the shah in person, and he obviously traveled unofficially, so he steered clear of the encampment which was surrounded with heavily armed military posts. But, he observed that the royal tents and those of many dignitaries had the size of genuine houses and that their external decorations suggested the high level of luxury within. In the absence of proper lodgings (Ismaïl had been too optimistic), Tinco was fortunate to come across a small farmhouse. The hospitable family was happy to allow Tinco and his men to set up their beds near the farmhouse – under the stars, but within the protection of the walled garden. The next morning, Tinco spent his time traveling the valley and examining the details of the royal encampment, which extended over a long distance along the river. The shah’s military men acknowledged him, but left him alone. Tinco doesn’t tell us whether he tried to enter the camp. Nor does he tell us why it was so important to him to make this demanding trip. The fact that he even mentions it with a precise date comes as a surprise, as only few of his activities in Tehran are dated – and he is very discreet about his time in Tehran anyway. This contrasts significantly with his general approach of his books, where he easily shares dates and facts about even the most insignificante encounters. Having said that, his extended stays in Tiflis and Baghdad are both marred by the absence of such detail as well. Even though Tinco Lycklama writes extensively about the history, the arts and the customs of these capital cities, from the narrative perspective it feels that he was doing many things there that are not coherent with the attitude of a “simple tourist”. We know that he met the most powerful men. Përhaps these local rulers and royalty may have found it interesting to meet a lonesome and somewhat excentric Dutch traveler. But, that doesn’t explain everything. The visit to Shahrestanak is just an example for those awkward aspects of Tinco’s travel through the Orient. We simply know (today) that all the powers of Qajar Persia were present at the Shahrestanak encampment when Tinco came for a look. After spending the night near the encampment at Shahrestanak, Tinco returns to Tajrish, taking another route – longer but easier to travel. And never mentions Shahrestanak again.